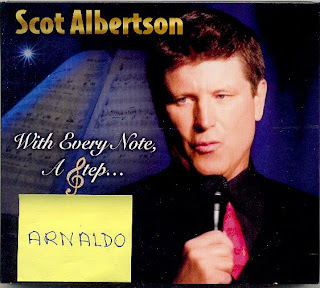 Jazz Station - Arnaldo DeSouteiro's Blog (Jazz, Bossa & Beyond): Vocal CD of the Month - "Scot Albertson: With Every Note, A Step..."
Vocal CD of the Month - "Scot Albertson: With Every Note, A Step..."
Highlights: a bossa nova version of "How Blue The Night" (H. Adamson & J. McHugh) and a haunting medley with Michel Legrand's "His Eyes, Her Eyes" (from "The Thomas Crown Affair") and Leslie Bricusse's "When I Look in Your Eyes" (the wonderful theme from the film "Dr. Dolittle). Featuring: Daryl Kojak, Cameron Brown, Tony Jefferson, Erik Friedlander, Jerry Scott, Dave Pietro, Sue Terry, Rex Benincasa, Marc Daine et al. Obama - "Another victory: Student loan reform"
Kate Reid live @ Steamers, tonite! Obama: "Today, add your name to mine"
Benny Russell Trio in concert, tonite! CD of the Day - "Mark Egan: Truth Be Told"
Obama: "Will you add your name?" CD of the Day - "Absolute Ensemble & Joe Zawinul"
EP of the Day - "Juicy: All Work, No Play"
Diana Krall awarded in Germany! DJ Tatiana Fontes @ Playhouse, tonite! DVD of the Day - "Lesbian Nation"
Obama: "What you're doing is working"
CD of the Day - "Trilok Gurtu: Massical"
Arlyn Valencia: MP3 album now available! Obama - "Day 7: Call into swing districts"
Sivuca/Toots Thielemans DVD comes out today! CD of the Week - "Irom Kim Style"
Free Autographed CDs! Act Fast! Sony Holland Duo live in California, tonite! Obama - "Days 3-5: The voice of the people"